Swede and potato gnocchi recipe. Boil swede and potatoes until soft. Mix in food processor until very runny. Add egg yolks and put the mixture back in a pan. Bring to the boil then continue to cook on a low heat for about an hour in total. Season (salt/pepper) and add flours. Knead into a dough on a floured board and break off little balls. Squash between hands to make gnocchi shapes. Put them in boiling, salted water and cook until they rise to the surface of the water. Drain and eat with favourite sauce. Fry some sage leaves in butter and some small-chopped rainbow chard stalks. Add the gnocchi and fry until brown and slightly crispy. Add grated cheese. Serve on a bed on a bed of quickly-fried chard leaves. Lovely Bosavern Community Farm leeks - the basic ingredient. a saucepan with butter or oil. and rub in about 100g margarine or butter. Serve with green salad and potatoes. We had this for dinner on Friday night and it was delicious - see our facebook page for photos of each stage of the recipe. Leek croustade ready to eat. A variation on spanakotiropita, a Greek spinach and cheese pie. You can make the pastry (e.g. 225g flour, 100g butter/marg) or use filo or puff. Separate the chard stalks from the leaves and chop both roughly. Simmer the stalks in a little water in a pan and steam the leaves. Use a fork to crumble 200g feta and mix with one beaten egg, 2 or 3 tablespoons of yoghurt and a handful of grated cheddar (or similar). Season with black pepper and grated nutmeg or fresh or dried dill. Roll half the pastry to fit a baking tray. Layer the feta mixture on top of the pastry and then add the steamed chard. Cover with the other half of the pastry and press the edges together. Score the top layer of pastry with a knife and brush with beaten egg. Bake in a hot oven (200°C) for 20 – 30 mins. Can be eaten hot or cold. You could use spinach or kale instead of chard. Thanks to Alice for putting this recipe together. The version on our Facebook page has photos of the different stages too. St Just craft and food market. 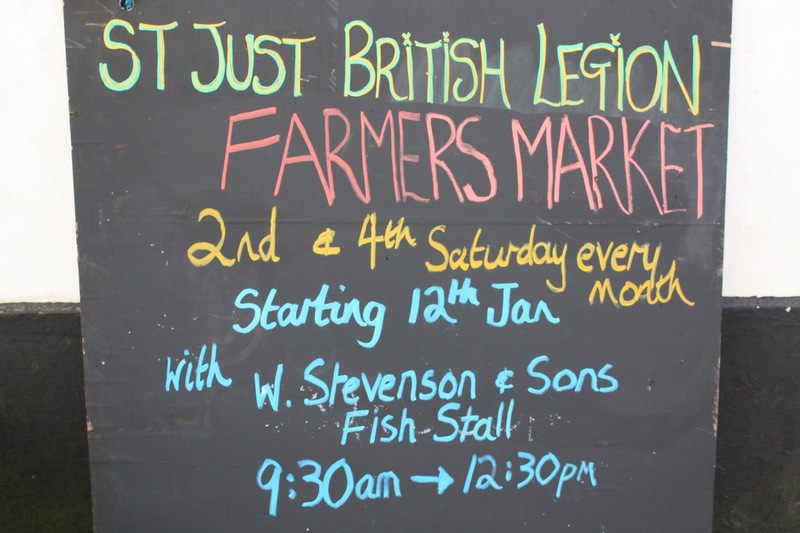 St. Just craft and food market has moved to the British Legion, and held its first market there on Saturday 12th January, 09:30 till 12:30. 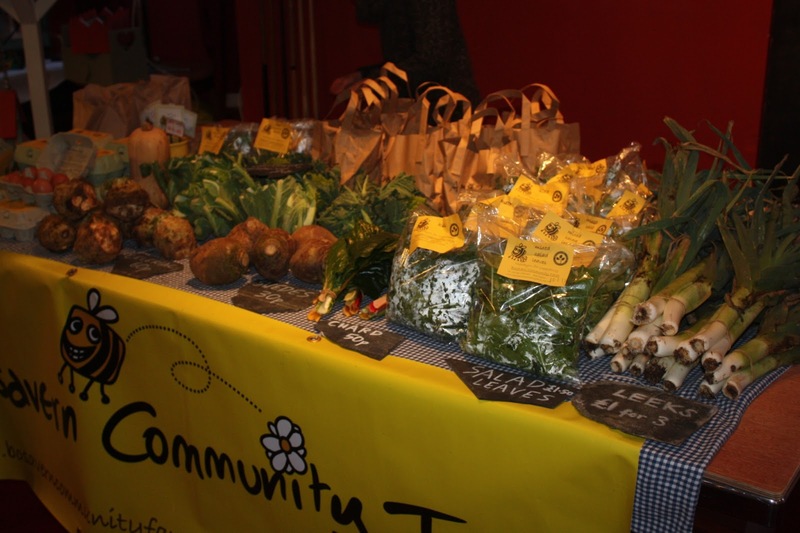 Bosavern Community Farm stall at the market. The Legion is a central location, next to the large free car-park, with a coffee-shop and bar. We had a stall there selling free-range eggs, leeks, rainbow chard, mixed salad leaves, celeriac, swedes, three varieties of potatoes, butternut squash, kale, romanesco broccoli, cauliflowers, and green sprouting calabrese. The market will continue in the Legion, on the second and third Saturdays of the month, from 09:30 till 12:30, so we hope to see you there in the near future. As well as our stall, and various craft stalls, there will be a cheese stall, meat stall, fish stall, and bread stall, as well as jams and chutneys. On Wednesday 19th December we slaughtered our 41 turkeys and prepared them for collection. We set up a slaughter unit inside the cow shed, so only had to carry each turkey 30m from their home, minimising their stress and discomfort. 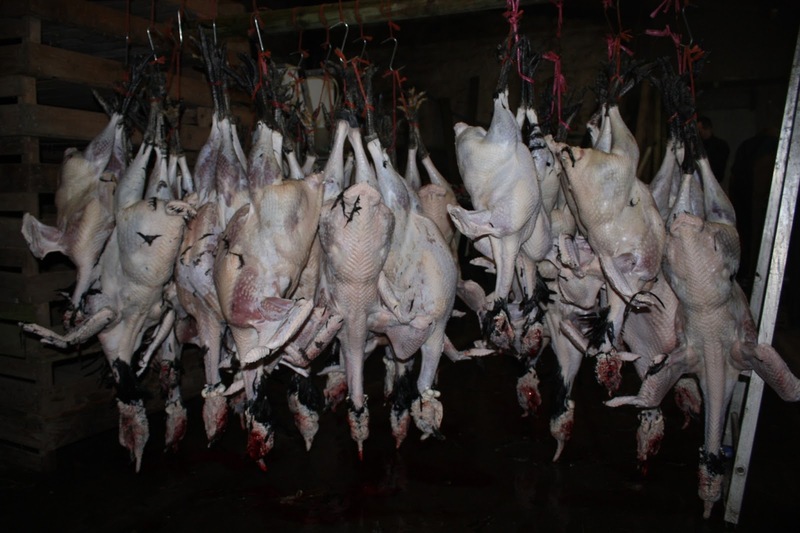 Then each was killed, plucked, gutted, packaged, weighed, and allocated to a customer depending on their preferred weight of bird (or as close as we could make it). The whole process for 41 birds took almost ten hours. Most turkeys were collected that evening by our customers, so thanks to them for being so prompt. The average weight of turkey was 6.7 kg, so average cost was £70. Early indications show that we actually made some money on these turkeys, which is good for the modern farming climate, and the least we should expect after looking after them for 5 months. Turkeys killed, plucked, and hung awaiting gutting. 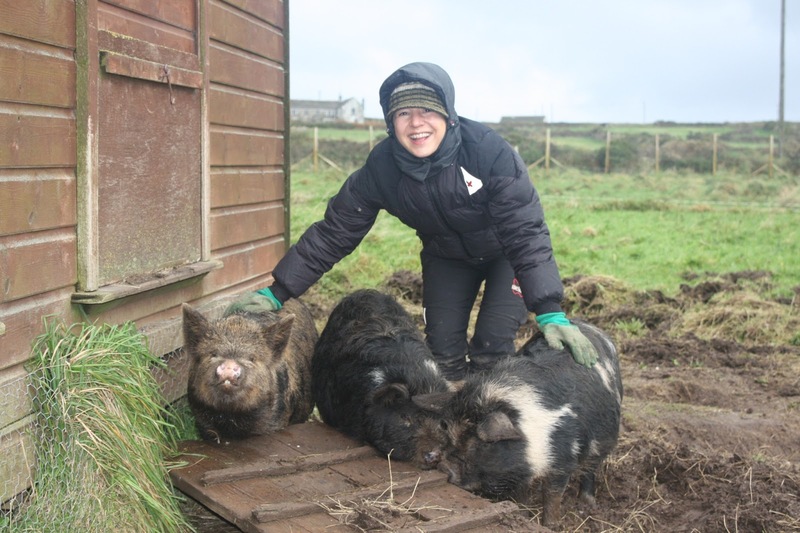 Many thanks also to Chiara, who wwoofed with us for 10 weeks from October to January, helping to run the farm over Christmas. 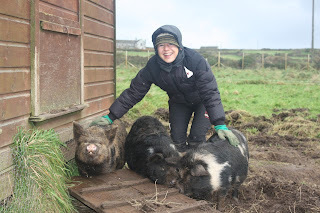 Chiara is pictured with 3 of our kune kune pigs - Blue, Lowenna and Ginger - who moved to another farm in December. 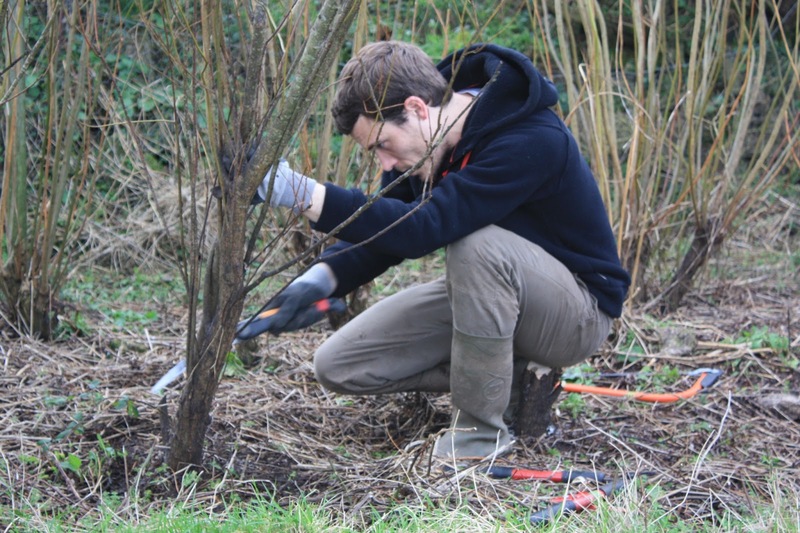 Many thanks to Nico, who volunteered here for 5 weeks in November and December, helping to look after the farm over Christmas, allowing several of us to visit our families in other parts of the country. It was great to meet you and work with you Nico, and all the best with your onward travels. 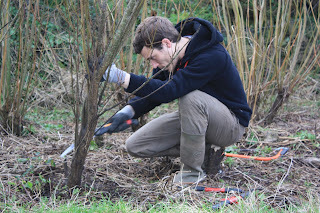 Nico coppicing willow during the coppicing workshop.